Sometimes you just stroll into something beautiful. When I strolled into the hall where Aradhna were playing on a chilly Sunday afternoon, it was to get warm for a few minutes. I stayed for an hour and came out feeling like I was glowing. Aradhna are a worship band, but unlike anything you’ve probably experienced before. 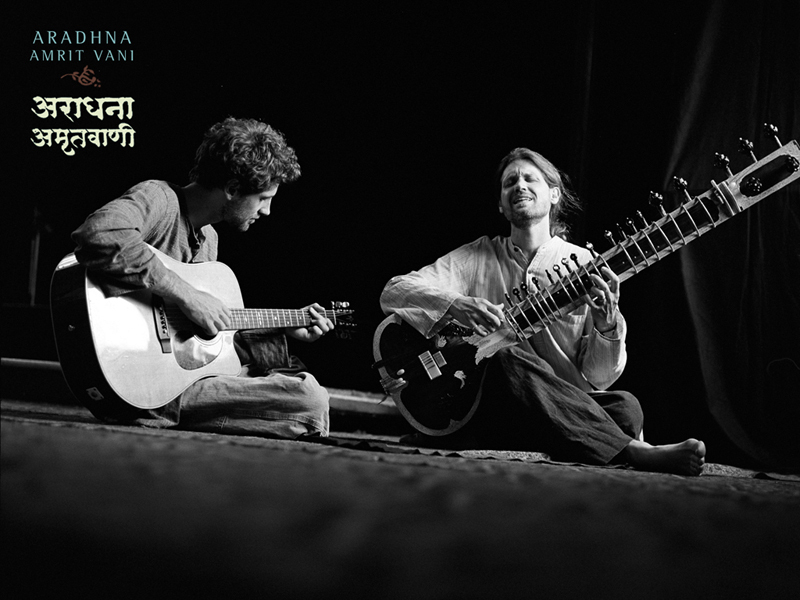 It’s not just that this is Sitar/Tabla based music, sung to Jesus in Hindi, Nepali and several other languages of the Indian subcontinent – it’s that it’s being sung by a couple of white guys. ‘Unusual’ is the first impression. But any thoughts of fad-based gimmickry, of western Worship and ‘World Music’ cashing in on ‘ethnic’ sounds dissolve after just a few minutes in Aradhna’s presence. Primarily because it is so beautiful. Not understanding the words does not seem to matter. Nepali-raised Chris Hales (evoking strong impressions of the Jesus of one’s imagination with his long hair, robes and air of profound peace) explains almost every song. From contemplative worship pieces written by Christian Sadus (or holy men) to songs of tribute to ‘Catholic Hindu’ teachers, the theology behind the music may seem strange or even troubling to some, but the overwhelming sense of God’s presence, of Jesus-worship (evoked not only by Hales’ obvious and outspoken love for the Son of God, but by the feeling of the worship) made even a theological conservative like me feel totally comfortable. As white-haired couples watched from folding chairs, hippie chicks swirled around in long skirts and children danced with their fathers to the sides of the audience, many like myself just laid down and soaked in one of the most calming, beautiful performances I have ever had the privilege of witnessing. If you are into world music, if you are interested in worship that goes beyond translating ‘Shine Jesus Shine’ into Hindi or if you are just tired of being bored and unmoved by music or worship, Look out for Aradhna, the next time they play near you. You can find out more and join their mailing list by visiting www.aradhnamusic.com.